WTI prices are back into bullish territory, opening above the daily close and printing fresh highs in the correction. After Trump stirred-out action when he recently tweeted that the price of oil was too high sending it sharply lower, the energy minister of Saudi Arabia, Khalid Al-Falih, has more recently reiterated the Saudi's commitment to cut output and re-balance the market. The minister was implying that production cuts could be extended into the second half of 2019. 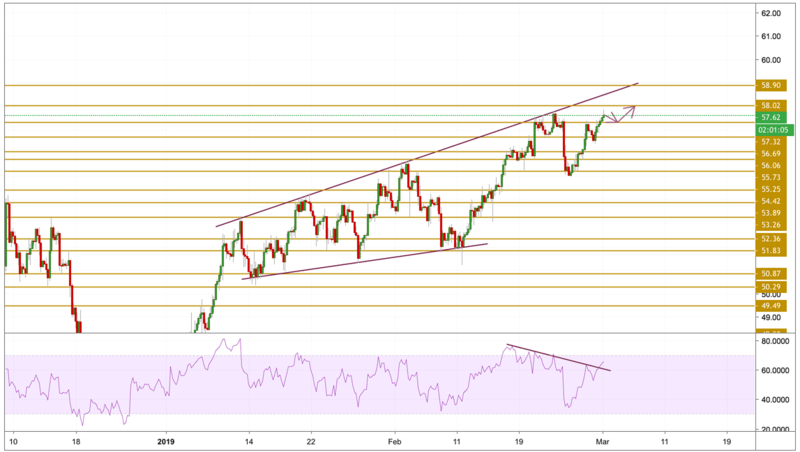 This has given the oil market a lift along with the Energy Information Administration reporting on Wednesday that US crude supplies had unexpectedly dropped by 8.6 million barrels. Crude prices continued to surge during yesterday's and today's session printing new highs of $57.85 per barrel after correcting from the recent sharp fall. The price is currently retreating from the new highs but the momentum is still bullish as it broke up as we can see on the RSI. The upward move is still more likely to continue, that is why we will be focusing on the $58.02 resistance level.